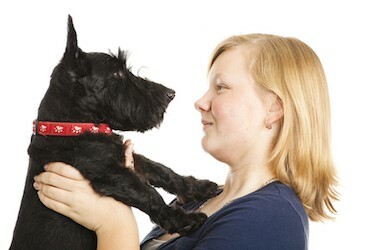 Teenage girl holds her Scottish Terrier nose to nose. When you think of the Scottish Terrier temperament, you may remember the dapper little Jock and his undying loyalty for his friend Lady in Disney’s Lady and the Tramp. These little dogs, often called “Scotties” and as brave as they are cute, but there is more to their personality than meets the eye. As his name suggests, the Scotty originated in Scotland in the 1700’s as a hunter of small critters that live in dens such as rabbits and fox. Life Span – Scottish Terriers can live to be between 12 and 15 years, though they have been known to live as old as 19. 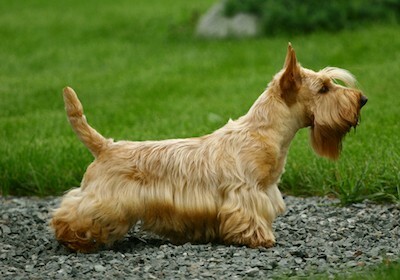 Size – Unlike many breeds, the male and female Scottish Terriers are pretty close in size. Male Scotties are usually between 18 and 22 pounds while the females are slightly lighter. Both males and females are about 10 inches tall. Coat – One of the best things to love of about the Scotty is his thick, wiry coat! Not only do they shed very little, they are also hypoallergenic and so make a great pet for someone with allergies. They do need regular grooming and should be trimmed twice a year. There are many things about the Scottish Terrier temperament that make him a great dog for the right person. Though low to the ground, Scottish Terriers are not “small dogs” and they have a deep, intimidating bark to prove it. The fearless side of the Scottish Terrier temperament means he will stand up to intruders and sound the alarm when necessary. If you are more of an armchair athlete than a weekend warrior, then you will get along great with a Scotty! These dogs are perfectly happy with an easy stroll around the block and the occasional short game of fetch. Keep in mind though that even the stoic Scotty-dog will develop bad behavior if he doesn’t get at least some walking every day. Some dogs like the Labrador and Golden Retriever never seem to outgrow their puppyhood, but that is not the case with the Scotty. While playful and silly as puppies, as an adult the Scottish Terrier temperament is often described as “stoic” and are usually calmer than most other terriers. The Scotty is loyal, especially with that one special person, but there are some things about the Scottish Terrier temperament that you should be aware of. Scottish Terriers are very independent. All terriers have a self-reliance about them, but the Scotty is more independent natured than most. This can be a problem if you don’t know how to work with this type of dog. The ideal Scottish Terrier owner will be able to establish himself as the leader of the pack and be consistent in his expectations. While Scotties are able to get along with other dogs that he has grown up with, they tend to be aggressive to strange dogs and are not intimidated in the slightest by those bigger than them. Scottish Terriers are very loving once they get to know a person, but it can take a while before they let someone into their elite circle of friends. You’ll want to make sure to socialize your young Scotty early and often to keep him from thinking of everyone he meets as a stranger to protect you from. If not properly socialized the natural discriminatory Scottish Terrier temperament can become overly suspicious of anyone who enters the house. The Scottish Terrier is a fairly sturdy little dog but there are a few health concerns to be aware of. The Scotty Cramp – This neuromuscular disease is caused by a disorder in serotonin metabolism that can create a problem with their gait. Flea Allergies – Scotties are prone to flea allergies and other skin conditions that can make them uncomfortable. These can be easily avoided with a good flea control regimen and a healthy diet. Is the Scotty right for you? If you want a hypoallergenic dog that fits well in an apartment or small house, the Scoty might be have a lot to offer. His loyalty and charm make this dog a good choice for the right person, just be sure that you are aware of the challenges of the Scottish Terrier temperament before you bring one home. Next post: The Vizsla Temperament: Ready To Fulfill the Needs of the “Velcro Dog”? Previous post: The Italian Greyhound Temperament – What’s So Special About It?